Hi friends! I know, it's been a while, and I apologize for my long absence. I'm working on a separate blog post with some life updates just so you can understand why I've been a little MIA in recent months. But I'm back and I'm ready to share these incredibly delicious key lime pie cups! With August suddenly here, we're in the last few weeks of fitting in all the best summer flavors before pumpkin and chai take over our lives. Don't get me wrong - I love pumpkin way more than the next person - but I haven't had nearly enough key lime pie this summer season to be ready to part ways with it until spring just yet. The hardest part about this recipe is waiting for the cream cheese to soften enough to begin assembling it. Waiting for ingredients to thaw or soften is my biggest downfall as a cook/baker/person who spends a lot of time in the kitchen. It is so worth it for this recipe though because once the cream cheese combines with all of the delicious flavors, it is the creamiest treat to end your summer on. Add cream cheese, yogurt, and condensed milk to your mixer and beat on low until combined. Squeeze in the juice of your limes and continue to mix on low. Assemble your jars by placing graham crackers in the bottom half-inch of a serving cup. Top with dollops of the key lime pie mixture. Garnish with additional graham cracker crumbs or lime slice. Repeat for remaining jars until key lime filling is used. Refrigerate until ready to serve. 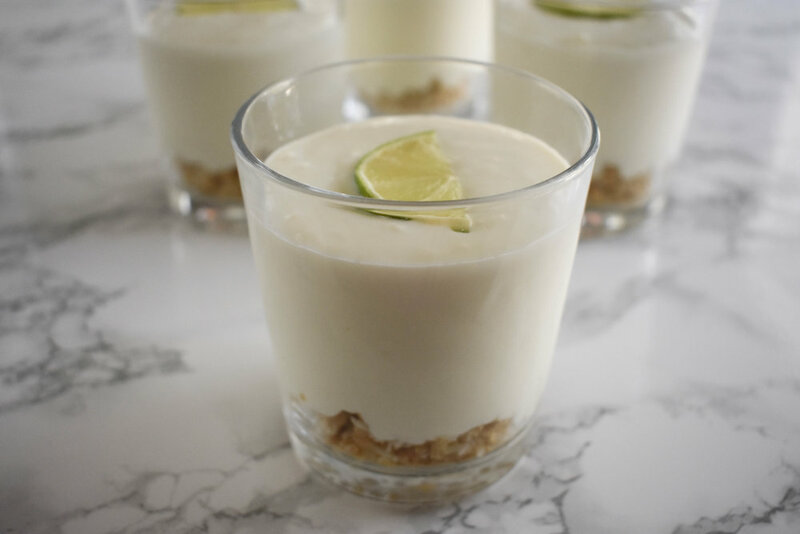 *I kept my key lime filling in the fridge overnight to make the cups fresh in the morning.